If you are searching for How to control get Air gesture like Galaxy S4 on your android device then your search came to an end. Air Swiper is the app which lets you do the same. It allows you to work more effectively and faster with your phone. It makes your life easier as well as using your smartphone. It is very useful, when you have got dirty hands or you are in a car. You can control your device by simply sliding your hand over your device just like what we saw on the Samsung Galaxy S4 and Lava Iris 504Q etc. This app works with device running Android 4.0 and above. 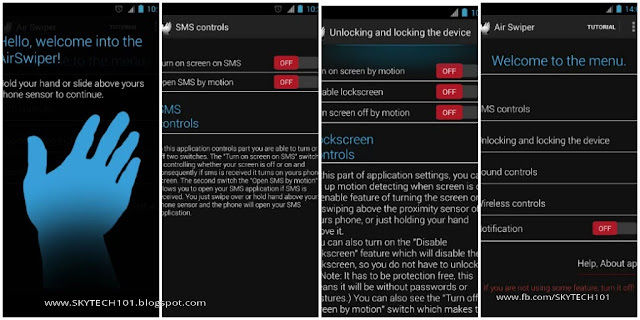 -Turn off lockscreen by m swiping over your device sensor. swiping over the device sensor. -Game mode – Turn on when playing games or using applications which needs proximity sensor.